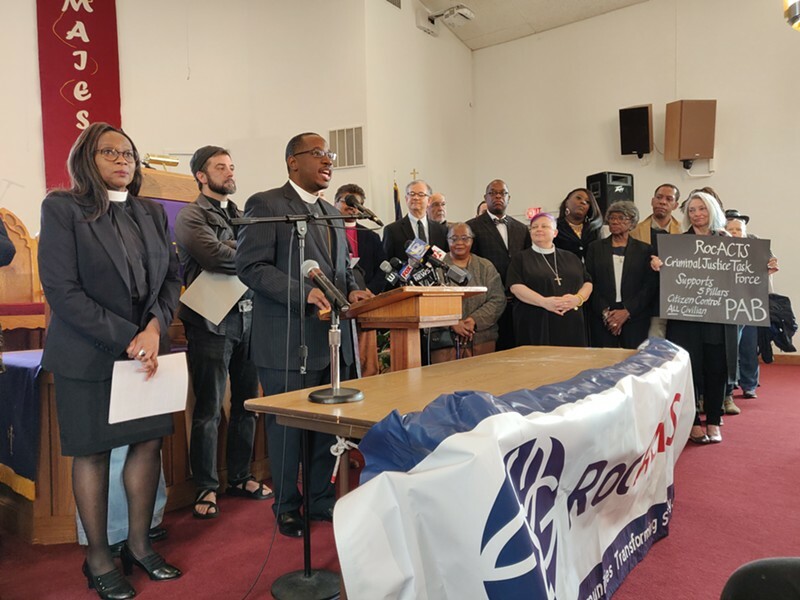 Members of the Roc/ACTS Religious Leaders Caucus gathered at Baber African Methodist Episcopal Church on Meigs Street this afternoon and called on City Council to pass the legislation it unveiled in January. That proposal barred former law enforcement officers from serving on the Police Accountability Board. The Rev. James Simmons, pastor of Baber AME, said that each week church leaders in the city hear about members of their congregations who are subject to police intimidation or misconduct. And they don’t have faith in the department’s ability to police itself, which is what it does now, Simmons said. The proposed Police Accountability Board doesn’t need a representative who “has been encultured in this system,” he said. It needs Rochester residents trained in the relevant state, local, and county laws as well as RPD policies and procedures. “We need an independent police accountability board and we need it now,” Simmons said. Simmons and the other clergy framed the board not as an attack on police officers, but as a way to improve relations and trust between law enforcement and the communities they serve. The addition of someone associated with law enforcement, whether they’re active with the RPD or not, would undermine the function and legitimacy of the Police Accountability Board, said the Rev. Wanda Wilson of Open Arms Christian Fellowship. City Council’s January proposal allows for the department, its chief, and any accused officer to provide plenty of input, she said. The department’s Professional Standards Section would also conduct its own investigations of complaints, and the accountability board would take its reports into consideration, she said. The Rev. Lane Campbell of First Universalist Church of Rochester said she and other clergy have heard complaints from people who either don’t have access to the resources needed to work through the current police oversight process, or who don’t take their concerns to the department because they don’t believe they’ll be listened to. “We know that there are so many who are unheard,” Campbell said, after she read a litany of names: people who were seriously injured or killed by Rochester police. The Rev. Matthew Nickoloff of South Wedge Mission urged Council and the RPD to learn from the experience of churches, institutions that have struggled due to their own lack of accountability. The point of a Police Accountability Board is not to “preach down at police,” he said, but to be mutually beneficial so the community can invest in officers’ well-being, too. “What we need is to take responsibility together,” Nickoloff said. A system of accountability would help keep that lie from being perpetuated, Singh said. And City Council’s January Police Accountability Board proposal is a meaningful democratic solution for holding a powerful institution to its responsibilities, he said. Joining the clergy were Sharlene and Frank Simmons, whose son, Silvon Simmons, was shot three times in the back by Rochester police officer Joseph Ferrigno in April 2016. The bullets ruptured his lung and damaged his sciatic nerve, Frank Simmons said. Silvon Simmons was a passenger in a car that Rochester police followed, thinking it belonged to a suspect, according to media reports of the case. The car pulled into Simmons’ neighbors’ driveway on Immelt Street and Simmons ran. Police alleged that he fired at them, but Simmons didn’t have any residue on his hands, and a weapon found at the scene didn’t have his DNA on it. He was charged with attempted murder but a jury acquitted him, and a judge later dismissed the weapons charge against him due to lack of evidence. Neither the police nor the hospital informed his parents, who lived in Memphis at the time, that their son had been shot; they learned from a relative who saw it on the news. And Silvon Simmons “spent 18 months in jail for a crime he did not commit,” Sharlene Simmons said during the press conference. The officer was never disciplined for anything he did, Sharlene Simmons said. Sharlene Simmons emphasized that there are good police officers who do good things, and that the family is a military and law enforcement family. Frank Simmons served for 10 years in the US Marine Corps, where he did two tours in Vietnam in an explosive ordnance disposal unit. He also served as US Marshall stationed on airplanes to prevent hijacking.